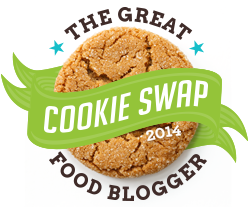 As another year wraps up and another holiday season arrives, it's time again for the annual Great Food Blogger Cookie Swap! This is my third year participating in this swap and I look forward to it every year! Not only are you swapping cookies with other incredible food bloggers, you're also getting food bloggers together for a great cause-- raising money for Cookies for Kids' Cancer. This year I decided to make a recipe that is reminiscent of cookies that I received last year from Maggie of Smashed Peas and Carrots. She sent me Cinnamon Button Chip Cookies that have been one of my favorite cookies that I've received. Her cookies are small and buttery, and I definitely recommend trying them out! These Cinnamon Chip Cookies that I'm sharing with you today are light, buttery, and deliciously cinnamon flavored! They are crispy on the outside, and slightly chewy on the inside. They are easy to pull together, but they need to be chilled completely before you bake them up so that they don't spread like crazy when baking them up. If I'm short on time, I pop them in the freezer so that they firm up! This is a wonderful recipe to try and I recommend making these if you're looking for a slight twist on a classic cookie! Using an electric mixer, combine the egg, butter, sugars, and beat on medium-high speed until light and fluffy, about 5 minutes-7 minutes. Add the heavy cream, vanilla, and beat to incorporate until fluffy again, about 2 minutes. Scrape down the sides of the bowl, and add the flour, cinnamon, cornstarch, cream of tartar, baking soda, optional salt, and beat until just incorporated, careful not to overmix. Roll out heaping tablespoon sized balls of dough (ping pong ball sized). Place mounds on a rimmed cookie sheet, flatten mounds slightly, cover with plasticwrap, and refrigerate for at least 2 hours or overnight. Preheat oven to 350F, line a baking sheet with a Silpat or parchment paper. Place cookies on baking sheet, spaced at least 2 inches apart and bake for 8 to 9 minutes, or until edges have set and tops are just beginning to set. Let cookies to cool for 5 minutes before removing and transferring to a rack to finish cooling. Store cookies airtight at room temperature for up to 1 week. I have a special place in my heart for honey. It's a part of my blog's name, and you can read a little more about the story of my blog's name here and it's something that I seem to collect because I always have between 5-7 jars of it! Honey is something that I use in my every day life and incorporate into my recipes-- it's a little secret that I learned from my brother for fried rice (recipe coming in the future) and whenever I'm hungry, it's always drizzled onto a tortilla slathered with peanut butter! Honey is incredible when it's marinated with soy sauce and chicken thighs. Honey is something that I find comforting that I turn to when I'm not feeling well-- hot water with lemon and honey soothes a sore throat. Honey is something that I use to also create special dishes, like Don Victor's Honey that contains honeycomb inside the jar which adds a depth of flavor and sophistication to honey I used for these special cupcakes that I'm sharing with you today! Don Victor Honey is not located in the usual place that honey is found.I found this Don Victor Honey in a unique location at Walmart-- the Hispanic aisle!! The Hispanic aisle is a great place to find new products! This is a great section to try new foods, like cookies, and is also a great place to find everyday products. This is actually the section where I buy my instant coffee (for baking) and my anise! I also received Don Victor's Whipped Honey with Cinnamon and other whipped honeys to test out. Whipped honey is amazing! If you haven't tried it, it's something that you must try! Whipped honey has a different texture than regular honey. I buy whipped honey from one of the local honey sellers at the farmer's market at work, so I am thrilled to find out that Don Victor offers honey as well and in different flavors such as cocoa, caramel, and cinnamon. These flavored honeys are absolutely wonderful on buttered toast, biscuits, tortillas-- especially when warm so that the honey gets slightly melty. It's also wonderful when it's melted and drizzled on ice cream! 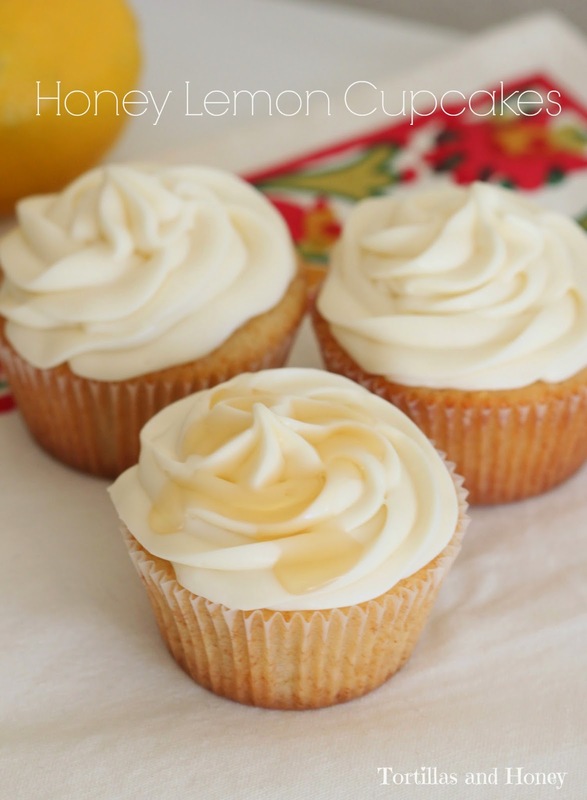 I decided to make these Honey Lemon Cupcakes for two reasons: 1) I recently recovered from a cold where all I wanted was honey and lemon, and 2) my mom's birthday was coming up and one of her favorite desserts are cupcakes. So not only do these cupcakes add a little comfort, they also are light and zesty that add a little celebration whenever you eat them. These cupcakes are light in texture as well as light in flavor. There's zest from the lemon, warmth from the cinnamon, and a smooth flavor from the honey. All of the flavors go incredible well together and these cupcakes are a tremendous hit with whoever has tried them, even ones who are a little unsure of the flavor combination. These cupcakes are one of the dishes that I've received the most compliments on and is something that will be one of my most requested recipes! 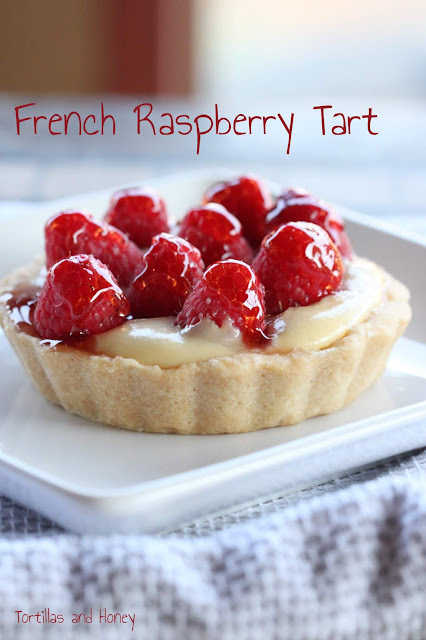 It's something that will be in regular rotation for desserts for special celebrations-- they're that good. Preheat oven to 350 degrees. Line a muffin tin with cupcake liners (you'll need between 12-16 cupcake liners). In a large bowl, use an electric mixer to cream together butter and sugar on medium-high speed for about 2 minutes. Add eggs one at a time and mix until just combined. In a separate medium bowl, whisk together flour, baking powder, salt, and ground cinnamon. In a small bowl, whisk together milk, honey, vanilla, lemon juice and lemon zest. Add half of the flour mixture to the butter mixture, beating until just combined. Add in the milk mixture, then add the remaining flour mixture, mixing until just combined. Bake for 18-20 minutes, or until a toothpick inserted in center comes out clean. Transfer to a wire rack to cool completely before frosting. Using an electric mixer, beat the cream cheese, butter, salt, and honey until light in color and fluffy, about 2-3 minutes. Gradually add in the powdered sugar until you reach your desired consistency. Frost the cooled cupcakes. Store cupcakes in the fridge until serving. I've been slowly working on trying to get this post done for over a week now and I just couldn't seem to get this post completed-- until today when the lovely Zainab at the Blahnik Baker mentioned on her Facebook page that it's National Cheesecake Day! So I buckled down and am getting those post to you all on National Cheesecake Day! I know it's been yet another two months since my last post, but I sure hope that this beautiful and scrumptious makes up for my absence. I really don't have any excuse as to why I haven't gotten more posts to you all because I'm on break from graduate school for the summer. I do think between work and school that I've been burnt out and I have been enjoying my free time entirely too much (Netflix, books, vacations to MD/VA/DC and camping and the lake and other fun activities and festivities)! It's going to be very hard to go back to school in a couple weeks. My parents have three fruit trees: apricot, cherry, and plum. I never really cared for apricots growing up, but my mom made the best apricot jam in the world (and still does!) which helped to foster my liking of apricots as an adult. This year, my parents' apricot tree produced hundreds of apricots and I've brought home three or four huge bowls of apricots! So I googled and searched on Pinterest for as many apricot (dessert) recipes that I could find and this recipe was the one that caught my eye the most-- an Apricot Cheesecake with Crumb Topping! The crumble or crumb on the cheesecake isn't an actual crumb or crumble, but a sweet pastry crust that has been grated so that when it bakes it's golden, light, and buttery on the top! I also love that the cheesecake has a nice layer of apricots, which you just line on top of the filling as you're assembling the cheesecake. The whole process of assembling the cheesecake looks beautiful, which really adds to the experience of making this cheesecake. You feel like you're creating a piece of art the whole time that you're putting it together, which made it really fun. Making this cheesecake does takes time, but seeing it come together and with a tasty end product makes it all worth it! In the food processor combine flour, cold butter, sugar and baking powder, pulse until the mixture resembles fine bread crumbs. Add the egg to the mixture, then pulse until just combined and the dough forms into a ball. Take the dough out of the food processor, it will be soft. Pinch off 1/3 of the pastry, wrap it in a plastic wrap and put in the freezer. Wrap the rest in the plastic wrap as well and put this portion in the fridge for 30 minutes. Combine cream cheese, eggs, sugar, flour, and vanilla in a large bowl using a hand mixer until smooth. Take the lined springform pan of the fridge and fill it with the cheesecake filling and line the top with the apricots, halved side down. Bake for 50 minutes or until the cheesecake is almost fully set and the crumb topping is a golden color. Cool cheesecake for an hour until cool to the touch and then chill it in the refrigerator for at least 2 more hours or overnight to ensure the cheese filling in cooled completely.